Andrew's adventures in home cheese making. Made a batch of Jack cheese today... and decided to spice it up a bit for the winter months. Thanks to the festive speckles of green Habanero and red chili flakes, it's a perfect cheese for Christmas! I'm not quite sure it's going to be spicy enough... but if that's the case, we'll just call it "Kickin' Lack" instead. 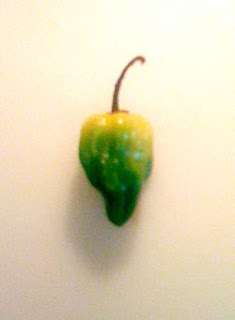 Thanks to Sean for the homegrown Habaneros and to Dana for the name! Notes: Boiled one pepper and chili flakes for 15 minutes in 1/2 cup water, strained the mixture, added the remaining water before renneting, added peppers during milling. Diced the second pepper and added it directly during milling. Jack M. Ehoff would approve!